I don’t know many kids who will turn down food on a stick. Heck, I don’t know that many ADULTS who will turn down food on a stick. It’s handy, it’s fun, it’s easy to eat, and somehow, it often just tastes better. I don’t know why, but it does. Since littler kids in particular often have a hard time transitioning into a lunchroom setting where they have a limited amount of time to eat, I think food on sticks is actually a great thing to send for them; the simplicity of picking it up and popping the little tidbits into their mouths can make it easier for these little ones to get a good meal into their bellies in a short time. Somehow, a sandwich can feel cumbersome for small hands, but putting that same sandwich in stick form may make all the difference. Here I’ve taken that king of all kid-friendly sandwiches, the cheeseburger, and cut up all the components to make skewers that are easy on the eyes and on the stomach. 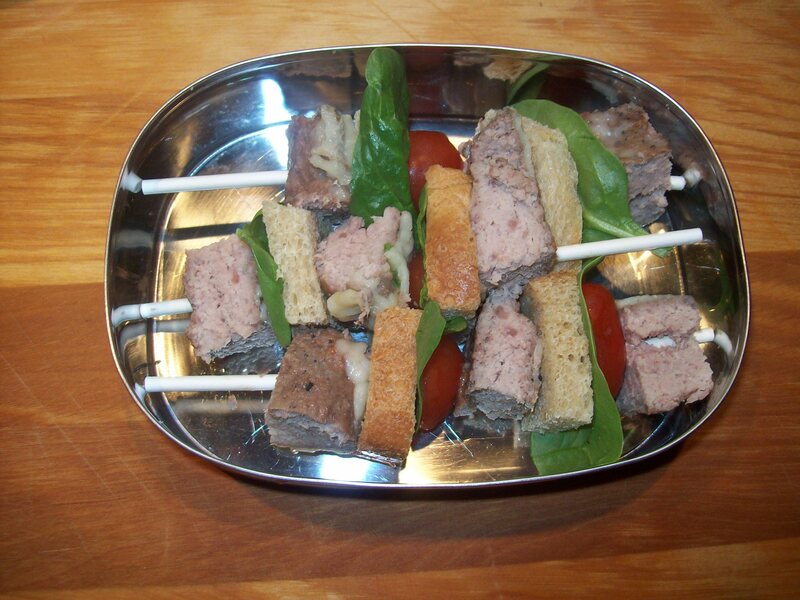 Thread ingredients onto each lollipop stick in the following order: Cheeseburger cube, bread cube, 2 spinach leaves, tomato half. Repeat with remaining ingredients until the skewers are full. (Keeping things in this order will prevent the bread cubes from getting too soggy in the lunchbox). Serve alongside a small dipping container of ketchup, if desired.